Arturia were one of the first music tech companies to embrace the concept of a paired virtual instrument player and hardware controller: their Analog Factory and Analog Experience pre-date Native Instruments’ and Akai’s keyboards by several years. In recent times these have evolved into the KeyLab controllers, alongside the Analog Lab software/plug-in. The KeyLab Essential range provides a very affordable way to get in on this action, with hardware that’s built to a lower price point but that still provides flexible MIDI control, DAW control, and an uncompromised version of the sound engine. The first thing I noticed about the KeyLab Essential keyboard was how incredibly light it is — not necessarily a bad thing if you’re gigging. While the build is undeniably plasticky, the keyboard does retain a certain amount of the stylish Arturia look, with its rounded edges and ivory-white finish, and it has eight big rubber feet that keep it solid on the desk. The small pitch and mod wheels are placed above the keys rather than alongside, saving space and giving a nice symmetry. There’s the familiar Arturia knobs, brightly lit (if wobbly) rubber buttons, slick low-profile colour pads, and a main central push encoder with a soft stepped action. You feel the budget begin to pinch when it comes to the keys themselves. The action is not too bad, but there’s a fair amount of lateral play, and the test unit’s keys were not consistently straight, resulting in noticeable gaps between some keys. There’s a good selection of controls. The nine knobs and faders can be switched between Analog Lab control, DAW control (via Mackie or HUI protocols) and six MIDI User pages. Switching is via the pads section, which has a dedicated Map Select mode, providing a nice big target and colour-coded visual reference. The primary connection is USB (which also powers the keyboard), providing separate virtual ports for MIDI and DAW control. There’s a physical MIDI output and a sustain pedal input. Analog Lab 2 is Arturia’s master software instrument, containing the sound engines of all the V Collection plug-ins. It houses over 5000 synth patches drawn from these instruments, all categorised and tagged, allowing easy searching and filtering by types, timbres and sources. A marked contrast with rivals Komplete Kontrol and VIP is that all the sounds are available, regardless of which other Arturia instruments you own. If you own the individual plug-in used in a patch, you can open its full user interface directly inside Analog Lab, otherwise you only access the pre-mapped parameters. You can browse the sound library using the push encoder and small display in the centre of the keyboard. There are buttons for toggling the encoder between tag filtering and patch list scrolling, and dedicated next/previous patch buttons. The workflow was not immediately obvious, and it’s easier if you refer to Analog Lab on the computer screen. But it’s enough to keep you a bit more hardware focussed, and the layout is actually enhanced compared to the full-price original KeyLab. Each Analog Lab patch has key parameters pre-mapped to the sliders and encoders on the keyboard. Most maps follow a consistent scheme, to the extent that typical controls are hard printed on the surface. These are two ADSR envelopes and a master level across the nine sliders, a pair of knobs for filter control and another pair for LFO control, with the rest variable. Things are kept fairly simple: there’s only ever a single bank of controls. The mappings can be seen in the software or plug-in at the bottom of the window. Take over is always smooth. The pots are endless encoders rather than old-school absolute value knobs. Sliders take over using the Ableton-style scaling. As soon as you move a slider the software knows where it is and draws a ‘ghost’ fader showing the hardware position. Any movement will produce relative adjustment of the mapped parameter until the physical and virtual sliders come together. Clever! There are a couple of nice features for live players. Two presets can be dropped into a multi-patch, with the notes split or layered. In this mode you get three separate control banks, which can be selected directly from the keyboard. You get both the original presets’ control maps, plus a ‘Live’ bank that controls levels and sends for the multi from the faders, plus eight macros on the knobs. These macros can be user-defined, with up to four parameters per knob, which you can map to the live mixer controls or the original plug-in parameters if you own them. The other live feature is Playlists, which are custom patch lists that can be scrolled or stepped through from the keyboard. Things are pretty straightforward around the back of the KeyLab Essential, with just a MIDI out port, quarter-inch sustain pedal input, USB port and power socket. DAW control is handled by good old-fashioned Mackie Control and HUI modes. To switch between the two you’ll need to install the Arturia MIDI Control Center software utility, which is also used for creating and managing user MIDI maps, firmware updates and a few user preferences. Ableton Live spotted the KeyLab Essential controller and set itself up automatically — I love it when it does that. Logic and Pro Tools both required a manual process of adding Mackie or HUI devices and selecting MIDI ports. Pro Tools kept throwing up a dialogue saying that HUI communication had been interrupted, until I eventually chose to suppress warnings. The central section on the surface labelled DAW Command Center has transport controls and a few miscellaneous functions: Save, Undo, Metro and Punch. Transport all worked in Live, although the Record button is mapped to the Arrange Record rather than the typically more useful Session Record. Everything worked correctly in Logic. The Metro and Save buttons didn’t work in Pro Tools. The central data wheel section has some implementation in Logic and Live. In both, the wheel controls timeline position, which is a nice touch. In Live the left and right arrows select between tracks. As I’ve said in other reviews, this is the single most useful thing a MIDI keyboard can do, but it’s surprising how often it’s omitted; it really ought to work in Logic and Pro Tools too. DAW mode provides fader and pan controls from the sliders and pots, in all the hosts I tried. Mapping can be nudged one track at a time across your mixer, or banked in groups of eight. By default the faders are set to Pick-Up mode, where the hardware control only takes over when the physical fader passes through the same point as the software fader. However, this behaviour was rather flaky in all the hosts I tried. I generally needed to move the fader from top to bottom several times before the mapping kicked in. Once it did, it would continue to work. This needed to be done for each fader. In the end, I switched to Jump mode, where the hardware takes control as soon as you move a fader. Custom MIDI maps can be set up in the Control Center, then recalled from the drum pads. 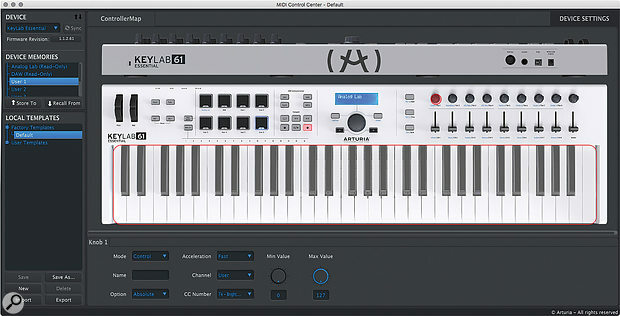 Unlike Akai’s VIP or NI’s Komplete Kontrol, Analog Lab does not try to be a host for all instrument plug-ins; it’s purely devoted to the Arturia V Collection. So for other plug-ins and instruments you’ll need to fall back on more generic MIDI control. Unfortunately the Essential keyboard doesn’t have the same DAW codec support enjoyed by the more expensive regular KeyLab (‘non-essential’?) models. Therefore you won’t get any intelligent integration with, for example, Logic’s built-in instruments and smart controls. On the plus side, though, you can program six of your own MIDI User pages, and easily flip between these and the Analog Lab and DAW control layers via the pads. This could be preferable if you need to control hardware instruments, or if you’d rather not use a proprietary plug-in host. In fact even if you use the separate Arturia instrument plug-ins without Analog Lab you still get much the same control. KeyLab Essential is a well-thought-out ‘lite’ version of the full KeyLab experience. The budget is kept highly competitive, which does impact the build quality of the keyboard in a few places, but it still looks and feels better than many entry-level controllers. Particularly welcome is the use of endless rotary encoders instead of knobs. The display is modest, but patch browsing works well with the Analog Lab 2 software’s library and gives simple access to playlists and layered patches. And of course Analog Lab 2 gives you access to the rich sonic palette of the V Collection. The closest equivalent competition at this sort of price are M-Audio’s Code 61, and Alesis’s VI61. Both have slightly more controls, though only the Code has endless rotaries. You’ll also get some DAW control, and integration with an instrument plug-in: VIP in this case. VIP is more flexible, being able to host any plug-in, but there’s a lot less included in the bundle. The V Collection sound palette and integration are a clear differentiator for the KeyLab Essential. 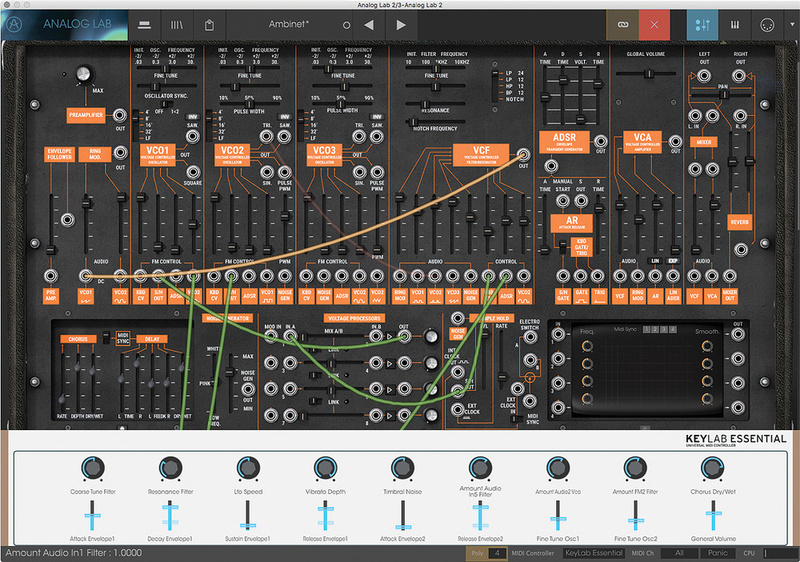 Buying any V-Collection plug-in unlocks its full user panel inside Analog Lab 2. Arturia’s V Collection has grown to an impressive 21 modelled classic synths and keyboards, and their TAE (‘True Analog Emulation’) technology has a well deserved reputation. The collection now includes the ARP 2600 V, B3 V, CS-80V, Farfisa V, Jup-8V, Matrix-12 V, Mini V, Modular V, Prophet V, Prophet VS, SEM V, Solina V, Stage V, Synclavier V, Piano V, Vox V, Wurli V, Clavinet V, CMI V, DX7 V and Buchla Easel V.
Analog Lab 2 contains all these instruments, effectively giving you access to all their sounds without full access their front panel. If you do purchase any of the individual plug-ins, or the full collection, their full UI becomes available. Even without this, you can browse sounds by the individual instrument sources, so it’s almost like having them! Sketchy fader control in DAW Pick-Up mode. Hardware feels a bit cheap. Track select only works in Live. KeyLab Essential is one of the most affordable ways to get started with a flexible controller keyboard and a deep bank of quality synth sounds that can be unlocked later as full plug-ins. KeyLab Essential 49 £179, KeyLab Essential 61 £219. Prices include VAT. Keylab Essential 49 $199, Keylab Essential 61 $249.